The Himalayan Birch is without doubt one of the most beautiful garden trees used by landscape architects and designers alike. 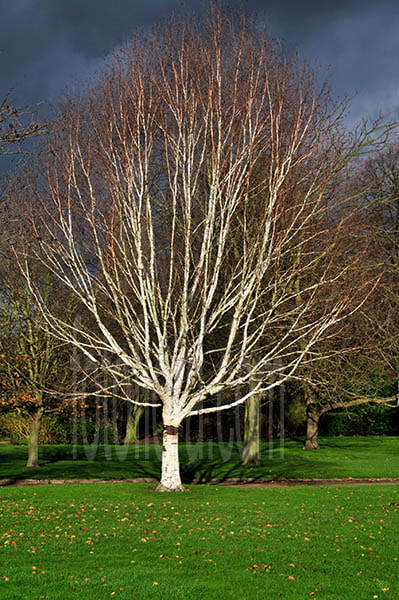 Gleaming white bark provides year round interest and may be its biggest virtue but this versatile specimen is useful on nearly any soil including urban situations. Off medium size and neat upright form this quick growing tree is suited to most gardens bar the very small. In spring attractive yellow catkins appear followed by charming dark green ovate leaves on ascending branches from mid spring onwards. In autumn, the foliage turns a glorious golden yellow before falling and leaving us again with the elegant framework of pure white branches. An excellent specimen addition to any garden especially when used against an evergreen background, it offers graceful elegance and provides dappled shade for underplanting with shrubs. Fully hardy.